Bangkok, Thailand. 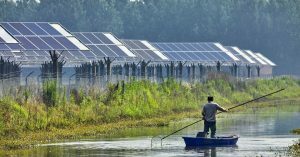 Southeast Asian countries are on course to meet their aspirational renewable energy target of a 23 per cent share of total primary energy supply by 2025, according to new analysis from the International Renewable Energy Agency (IRENA). Achieving this target would also significantly improve the access to affordable clean energy in the region in line with its pursuit of Sustainable Development Goal (SDG) 7.